Here are some of them drying. If not for the newspaper underneath, I think the leaves spread out in their various colors are quite pretty. Perhaps we can lay them out like so on a table the day of. LEFT TO DO: I think the medium-sized leaves will need an additional coating on the back b/c we'll likely use those as place cards and ppl will actually be allowed to touch them but for the little ones I'll leave less protected and probably scatter them on the table (to psych ppl out, haha) or use as decoration in some way. 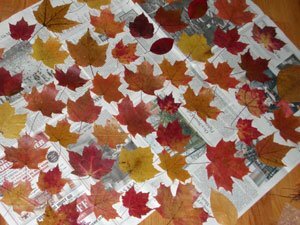 And of course, still have a whole other stack of leaves to begin on. Will we need so many? Yes, damn the 450! 4/23 UPDATE: I finished all the leaves and painted the back of some of them. Unfortunately, I added a little too much water to the gel and it took forever to dry and the watered-down solution didn't make it as stiff. Also, the water made some of the leaves more wrinkly (instead of the perfectly flat leaves from before). When my mother saw me doing this, she called me crazy. I now agree with her and I dread the thought of doing anything more with these leaves (like writing ppl's names on them). I hate leaves very much! !